HÀ NỘI – Việt Nam’s yarn industry faces many challenges in production and export, especially to China, one of the largest export markets for local yarn products, according to experts. The Việt Nam Textile and Apparel Association (Vitas) said that in December 2018 and January 2019, Việt Nam’s yarn production industry had to accept a drop in yarn price to $2.6 per kilo, as well as a kilo of cotton falling to $2.1, to maintain production and keep customers. Normally, in yarn production and trading, when the gap between raw material buying prices and product selling price is $1 per kilo, yarn producers can maintain operations. However, from October 2018 until January 2019, the gap was only 50-60 US cents per kilo. Therefore, the yarn manufacturers had to suffer huge losses from their yarn production, said Lê Tiến Trường, Vitas deputy chairman. For many years, Việt Nam’s yarn products have been mainly exported to two major markets – China and Turkey. 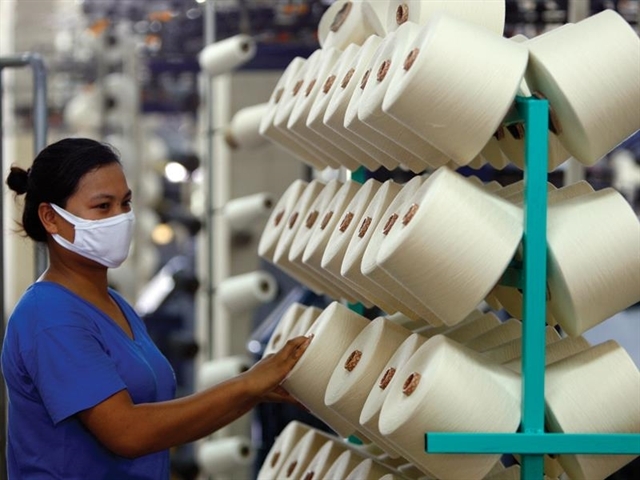 However, Turkey has applied anti-dumping measures on Vietnamese yarn so 70 per cent of Vietnamese yarn products are exported to China, the largest fabric producer in the world, according to the Việt Nam Cotton and Spinning Association. Therefore, China’s reduction of yarn imports due to difficulties in exporting textile and garment products to the US has affected Việt Nam’s yarn production. Cao Hữu Hiếu, executive director of Việt Nam Textile and Garment Group (Vinatex), was quoted by the Investment Review as saying that domestic yarn production faced difficulties from the end of 2018. Local enterprises expected the yarn market to gradually warm up from the second half of this year, Hiếu said. Trường said enterprises needed to manage risks to maintain production while waiting for the market to recover.